The Toy Australian Shepherd originated within the United States. The Toy Australian Shepherd stands 10-14 inches and weighs between 12-17 pounds. The coat on the Toy Australian Shepherd is medium-length and slightly wavy though it can be straight. There should be feathering of the hair on the back of the legs. The Toy Australian Shepherd is an intelligent breed. It is primarily a working dog of strong herding and guardian instincts. This breed is an excellent companion and is versatile and easily trained performing their assigned tasks with great style and enthusiasm. The Toy Australian Shepherd is reserved with strangers, but does not exhibit shyness. The Toy Australian Shepherd is an intelligent breed. It is primarily a working dog of strong herding and guardian instincts. This breed is an excellent companion and is versatile and easily trained performing their assigned tasks with great style and enthusiasm. The Toy Australian Shepherd is reserved with strangers, but does not exhibit shyness. The Toy Australian Shepherd is an excellent companion for children. They act as a devoted friend and guardian. Toy Australian Shepherds are easy going, loyal and courageous. 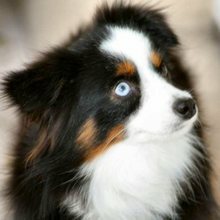 The Miniature Australian Shepherd can become nervous and destructive without frequent socialization and proper exercise. They are working dogs and want a job to do. You can find Toy Australian Shepherd puppies priced from $200 USD to $11111 USD with one of our credible breeders. Browse through our breeder's listings and find your perfect puppy at the perfect price. The Toy Australian Shepherd is an excellent companion for children. They act as a devoted friend and guardian. Toy Australian Shepherds are easy going, loyal and courageous. The Miniature Australian Shepherd can become nervous and destructive without frequent socialization and proper exercise. They are working dogs and want a job to do. The Toy Australian Shepherd needs little grooming and are an average shedder. Brush occasionally with a firm bristled brush and bathe only when needed. The Toy Australian Shepherd is easily trained. They seem to have a sixth sense to know what their owner wants and they are very eager to please. The Toy Australian Shepherd does need training at an early age to avoid nipping at the heels of humans as they are a herding dog by instinct and will try to herd their humans. The Toy Australian Shepherd needs daily, vigorous exercise. They enjoy long walks and play-time as they are an energetic breed. They do best when they have a job to do. Toy Australian Shepherd Puppies for Sale - Shipped Worldwide! Finding the right Toy Australian Shepherd puppy can be dog gone hard work. PuppyFind® provides a convenient and efficient means of selecting and purchasing the perfect Toy Australian Shepherd puppy (or Toy Australian Shepherd puppies) from the comfort of your home, 24 hours a day, 7 days a week. Take advantage of our PuppySearch or leisurely browse our directory of hundreds of dog breeds, Toy Australian Shepherd dog breeders, Toy Australian Shepherd dogs for adoption, and Toy Australian Shepherd puppy for sale listings with photos and detailed descriptions. Some Toy Australian Shepherd puppies for sale may be shipped Worldwide and include crate and veterinarian checkup. Many Toy Australian Shepherd dog breeders with puppies for sale also offer a health guarantee. With thousands of Toy Australian Shepherd puppies for sale and hundreds of Toy Australian Shepherd dog breeders, you're sure to find the perfect Toy Australian Shepherd puppy.